What is Peace all about? Mahatma Ghandi, Martin Luther King, Jr., Nelson Mandela, Oprah. Peace Begins with You, by Katherine Scholes. Another possibility: children (according to age levels) read short stories about people of peace on their own. Then, in small groups of 3 to 4, they discuss what they learned about peace from the biographies or stories. Each group makes a chart or draws pictures to reflect what they have learned about peace. For further inspiration, Teacher and children go to Possible Acts of Peace on this website. Every child reads one aloud and comments on it. 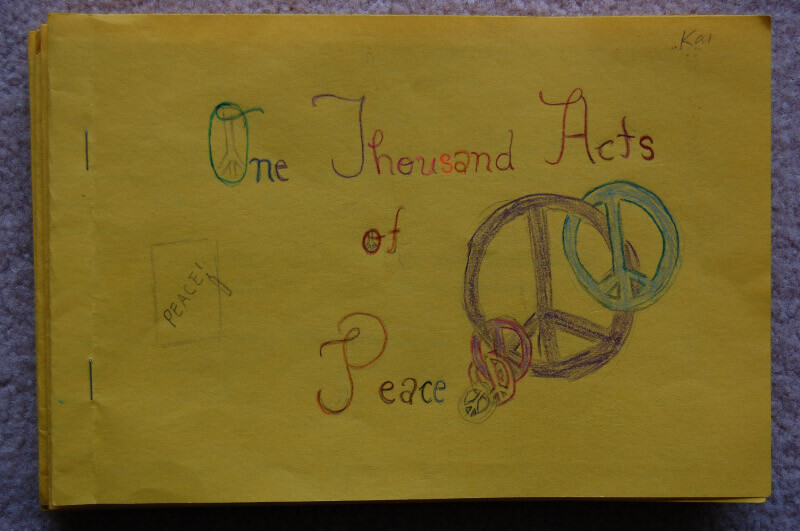 Children then make their own Acts of Peace notebooks, draw and color the covers, write a starting date, and record “Yesterday’s Act(s) of Peace” that they’ve just remembered. The next day (and every day), children return to their journals to record “Today’s Act(s) of Peace” . . . beginning with One a Day . . . and gradually working up to Three a Day. The Acts of Peace notebooks may be hung around the classroom on a sturdy string, like a clothesline, and attached by multi-colored clips, so that every day, the children pick them off the line and keep them at their desks . . . to record their intentional Acts of Peace at the appropriate time. Note: In notebook journaling, Teacher may allow short phrases, incomplete sentences – even lists with bullets – so that writing Acts of Peace is never a burden and is age appropriate. In this activity, children make a Peace Bracelet they can wear – as a reminder to commit Three Acts of Peace a day. Teacher cuts a piece of heavy elastic thread and gives each child about 16-32 beads (depending on size) with three special beads slightly larger and of brighter color than the other beads. Teacher knots one end of the cord and slips on one bead to begin. Teacher invites the children to string almost half the beads, then alternate with the 3 special beads, and then string the remaining beads onto the cord. Teacher (or another student) unties the end bead and knots the elastic ends together after fitting on the child’s wrist. Teacher puts a dot of glue in the knot to keep it from untying and trims the ends after glue has dried. Children can see that the three special beads are Acts of Peace are easily intermingled with everything else they do all day long! Since it takes people to create conflict, it takes people to resolve it. If two or more children have a disagreement or generally just don't get along, Teacher suggests that they resolve their conflict by talking it through – as an Act of Peace – rather than staying angry, physically fighting, or shutting each other out. If children realize how they have hurt one another, either by word or action, they can be encouraged to say "I'm sorry" as an Act of Peace. This may be an individual or a small group project to decorate the classroom. 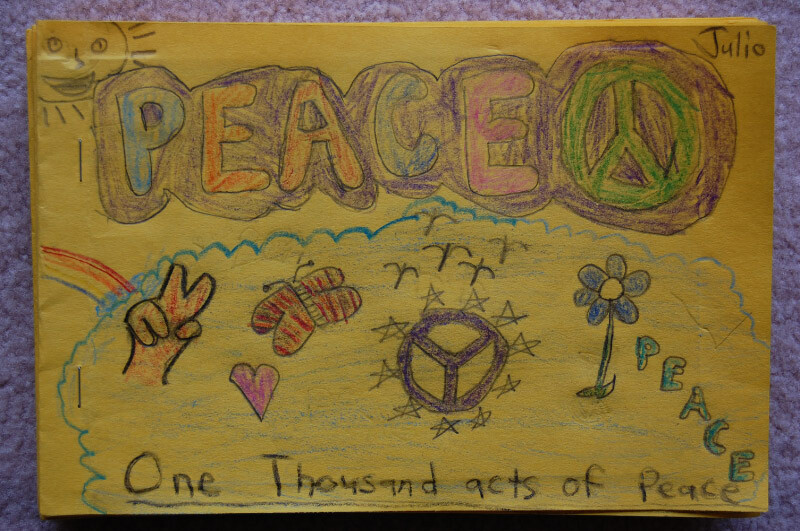 Children design, draw, and color Peace posters -- as reminders to commit daily Acts of Peace. TAP for Peace. A little Peace goes a long, long way. 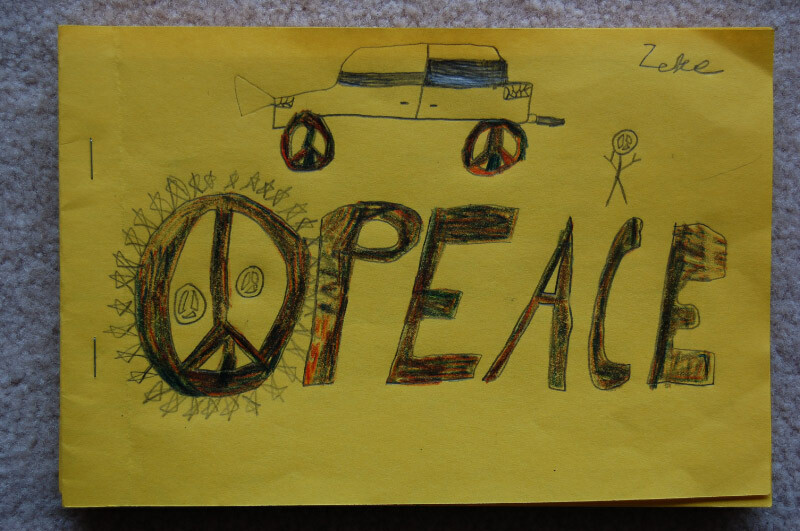 Children may also create Advertising Posters for Peace, based on TV commercials or print ads they’ve seen. GET YOUR FREE PEACE RIGHT HERE! We’re giving it away! NEW and IMPROVED Peace: Acts a lot nicer! Give PEACE away: Three times a day. Hey, Give PEACE a chance: I’m only a kid! developed for the Menno Simons Christian School in Calgary, Canada. What are Acts of Peace? What do Acts of Peace LOOK like? What do Acts of Peace SOUND like? What do Acts of Peace FEEL like? What do Acts of Peace TASTE like? and share how to recognize an Act of Peace when they see or hear or feel one! 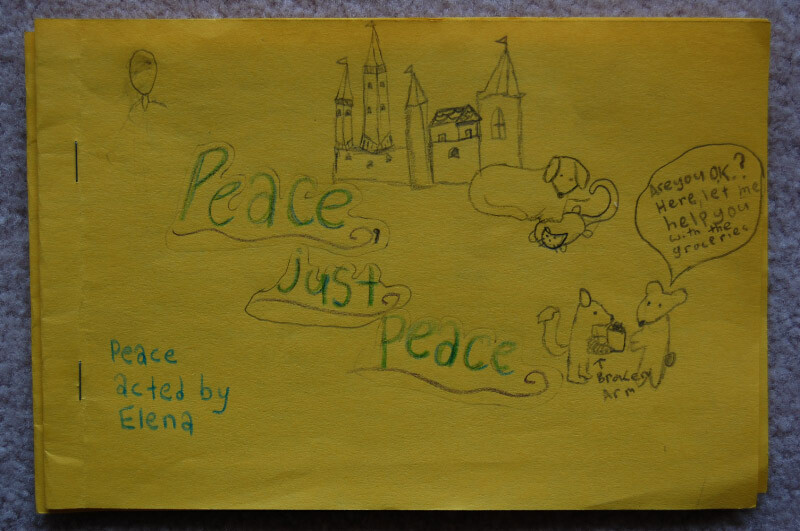 After a few days or a week of journaling daily Acts of Peace, Children view the Home Page ​on this website. Teacher and children take turns reading and discussing the page aloud (as much as is appropriate for the age level). Teacher encourages children to write longer, more detailed Acts of Peace stories which they wish to submit to this website's Peace Forum. When children have been practicing Acts of Peace on a daily basis, Teacher goes to the Peace Commitment link on this website and reads it through with the class. How it is a way of thinking before they act; a way of feeling about themselves and other people, a way of choosing how to act in each situation. Teacher and children also consider how we all sometimes forget to do three Acts of Peace a day, or do them but then neglect to journal them . . . We simply renew our Acts of Peace Commitment and start again. In this creative project, children are guided in writing the experience of committing an Act of Peace in a poem (or song) and then saying (or singing) it to the class. Teacher reads a short poem about peace to the class.Teacher suggests the class create its own poem about peace and writes the first line on the blackboard, with each child supplying the next line which Teacher adds for all to see. Teacher encourages the use of simile, metaphor, comparison, and contrast. Each line of the poem might start with: Peace is like...Or Peace is the same as…or Peace is …or Peace is not…Or Peace is different from…etc. Children might continue writing short poems every day to describe their own personal experience of Acts of Peace; either doing something peaceful or feeling peaceful or receiving peace from someone else. If children sing or play musical instruments, they might be encouraged to put their poems to music and accompany themselves (or each other) as they recite or sing their poem for the class. And the rest of the class can Tap for Peace in rhythm. In these short, unscripted skits or improvisations, children can experience doing Acts of Peace in imaginary circumstances with improvised conflicts, before they try them out in real life. Teacher may ask after each improvisation: How does it make you feel to TAP (Thousand Acts of Peace) or be TAPPED? “What’s up?” First child tells what the imaginary problem is . . . and the two talk it over, making up the words and acting out an Act of Peace. EX: Several children stand in line. Another child comes running in late . . . and really needs to get ahead. Someone in line objects. Another child lets the late child into the line . . . with a secret Peace sign. EX: One child gets "teased" by another. A third child walks by, hears it, and stands up for the first child. After the three talk it over, they all give each other a Peace Sign. EX: Two children "argue" over how to do something. A third child steps in to suggest another way to do it or to work together to solve the problem. All three find a means of turning a disagreement into an act of peaceful co-operation. EX: One child pretends to be "very angry" and wants to "get back" at someone for being unfair. Second child tells the first child why anger or revenge will only make more trouble . . . for everybody. Together they find a more peaceful way to turn the anger into a positive activity that will redirect the anger and resolve the conflict. Soon, children will want to suggest their own ideas for improvisations, often based on “real life” dramas they have experienced or conflicts they want to act out, in order to discover more peaceful solutions. This form of conflict-resolution through drama is a powerful means of giving children coping methods for life situations. What’s an Intentional Act of Peace? committing an intentional Act of Peace and simply staying out of trouble. Children are encouraged to think of and talk about an Act of Peace that they’ve already done: either yesterday, or some time in the past -- for a parent or grandparent, a sibling, a friend, a stranger. Teacher and children may also consider what the difference is between a deliberate Act of Peace, or kindness, or consideration, or honesty, or compassion, or forgiveness on the one hand, and a deliberate act of anger, bullying, jealousy, blaming, gossiping, lying, revenge, hatred, or even war, on the other. What are the consequences of these various acts? How might little acts of anger or hatred or revenge lead to bigger and bigger acts of war? How might little Acts of Peace lead to bigger and bigger Acts of Peace? 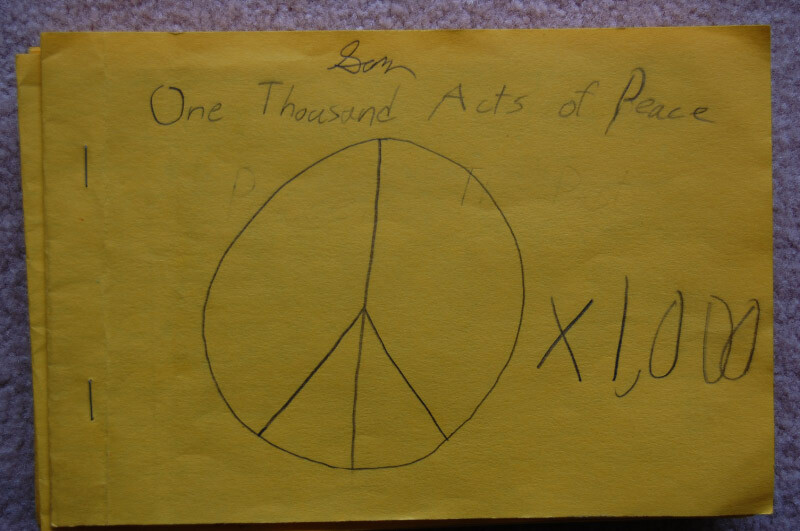 In this demonstration, children can get a sense of how their three Acts of Peace a day will accumulate to over one thousand in a year. Teacher takes 1,000 pennies or pompoms or colored beads or small stones -- or other small object with some mass. Teacher shows the children what a thousand looks like. Then Teacher takes three beads or pennies and shows the children that if they collect just three a day for a year, by the end of the year, they would have more than 1,000 of them. Introduce the idea that three Acts of Peace – some kindness, forgiveness, service, sharing, or thoughtfulness done to another – per day also would add up to more than One Thousand Acts of Peace per year. In order for the children to remind themselves to do these three Acts of Peace every day, they might make Acts of Peace Bracelets. In this class outing, children are encouraged to be more peaceful moving within the world around them. Class takes a Peace Walk together, through a public park, a country lane, up a hill, or into the woods. Walk quietly and slowly. Teacher alerts children to try to be quiet and peaceful, aware and very mindful of the things around them that they would normally miss because they are usually talking, or distracted, or listening to music, or checking their phones. For example: the look and touch of moss growing on a rock, the sound of water trickling, the smell of green grass or fresh flowers, the feel of the bark of a tree or a delicate leaf, the sight and movement of a bird or butterfly, an ant or squirrel, the sensation of a breeze or stiff wind, heat or cold on one’s face, the silence of the clouds moving overhead. When the group returns to the classroom, children list or draw some things that looked or sounded or smelled or felt like PEACE to them on their walk. Even in a noisy, crowded city, suggest that children take a Peace Walk whenever possible . . . and spread a little more intentional peace to the people they pass, with every step. This is a group project that helps children be on the alert for Acts of Peace and makes Acts of Peace a very cool thing to do. Children form small groups (not cliques!) and create a very specific sign or gesture that will remind them to do Acts of Peace toward each other as a group – or alert each other (in sign language) that a particular situation is an immediate opportunity for an Act of Peace – or simply to give each other a spontaneous Act of Peace, like slapping “high fives”. Teacher allows ten minutes for each group to create and practice its secret Acts of Peace sign or gesture. Throughout the week, children from each group try to “spot” the Acts of Peace signs and gestures of the other groups. The group that spots the most Peace Signs wins a prize. demonstrate what the world could look like. One child stands in the middle of the classroom and stretches out both hands. Two other children come and take both hands of the first child, on either side, and stretch out their hands. If the class is studying geography, each child might choose a country to represent as he or she joins the Acts of Peace Circle. EX: “I am Iraq" . . . “I am Iran” . . . “I am Afghanistan” . . . "I am Syria" . . . “I am Israel” . . . “I am Palestine” . . .“I am Egypt" . . . "I am North Korea” . . . “I am South Korea” . . . "I am China" . . . "I am Japan" . . .“I am the Sudan” . . . "I am Yemen" . . . “I am South Africa," etc. all around the globe. And so it continues, until every child is included in the Acts of Peace Circle. Teacher may then step in and close the Circle. Class sings a peace song (We are the world) and sways back and forth, holding hands. Teacher and children finish in silence by closing their eyes and imagining their hands encircling the whole globe for a minute or two of mindful awareness . . . in Peace. Here's a link from TES in London that teachers may find helpful. It includes a charming video showing the multiplying effects of one child's Three Acts of Peace a day, as well as lesson plans for teaching Acts of Peace, children's worksheets, and sample journals. Also: Check out the story about the Mennonite Church of Calgary, Canada that picked up on One Thousand Acts of Peace in 2009 and has since spread the word all the way to Kenya, Africa, via its system of "Pen Pals." "I teach fourth graders at a Berkeley public school. Since October, they've been writing daily in their K-TAP or peace booklets. It's the first they do at school in the morning, and, I'm happy to say, it's peaceful for them, and for me. They are still very involved, even in the fifth month, which is amazing. paper sandwiching lined pages. But, the count continues on. Each of their 3 or 2 or whatever entries each day adds to their goal toward 1000. Each month's booklet is labeled, not by the month, but as Volume 1 or 11 or as it is now, Vol. V.
We started out by talking about the good things each of us has done in the past and how even simple acts make a difference in the lives of others. We also share the kind, thoughtful, or helpful things others have done for us. These all are Acts of Peace and are its building blocks. On other days, we've discussed empathy, understanding, tolerance, and respect. I asked the children if they would like to try to reach One Thousand Acts of Peace each and they were very, very enthusiastic, so we began. After the first day's entries, we went round robin around the room with each student reading one entry. After about two weeks, I got the children on this peace site writing some of their acts, children teaching children how to do it. We just did that at the beginning, but now that the site has become more interesting, I'm hoping to get them back on again. The children "Kid TAP" each other, also. At first, I was fearful that "KTAPs" would turn into excuses to hit each other. But I introduced the idea any way, and KTAPs are just fine, no problems, and are fun. 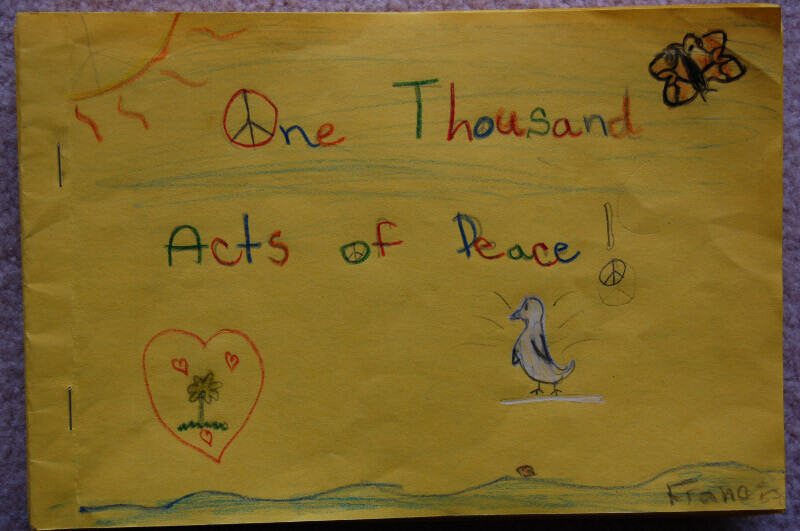 Children write in their peace books about their Acts of Peace from the day before. Most of their acts occur at home. Occasionally, I have them write "today's date," and ask the children to consciously try to do one or more KTAPs at school. It's delightful to watch. At our school's Winter Faire last December, a parent came over to me and spoke about this "peace thing" her child was doing. She said that he had started doing these wonderful things at home, that his attitude had changed for the better, and asked if I knew that he had even been suspended from school last year for some act of meanness. Our peace project meant a lot to her. We've done more, quick one week group studies of people of peace, and, yesterday, performed a "play" on peace. It's all been worthwhile. Our official social studies curriculum in fourth grade is California, but I hope to take our peace studies to informal studies of children in other cultures. That feels about right!" 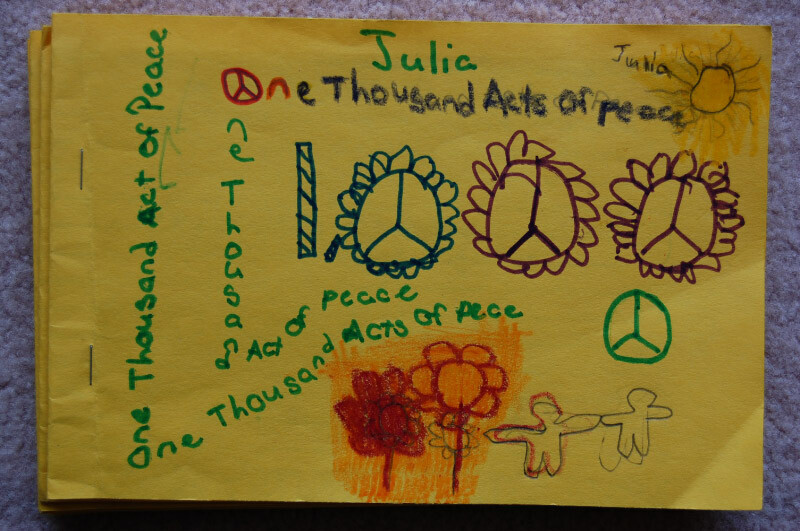 These suggestions for Peace Activities in the classroom have been donated to our website by educators using One Thousand Acts of Peace in pilot programs and classrooms around the world -- from the USA to the UK, from the Middle East to Africa. 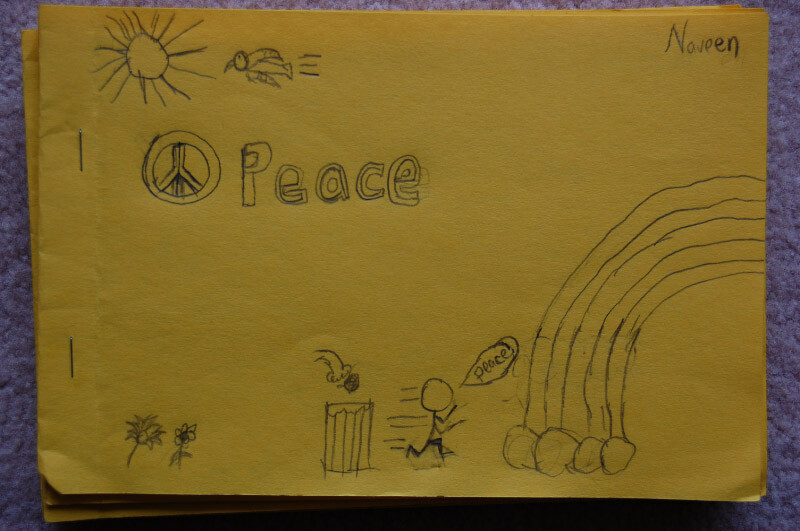 We welcome your own suggestions for teaching Acts of Peace to all age levels. PLEASE SHARE them with other teachers (as an Act of Peace!). And be sure to visit our website regularly as we add more and more Kids' TAP for Teachers. Thanks! Note: This page is dedicated to the children and teachers of Newtown, Connecticut, 2012.